Somerset-based Burnham Mobility, which provides a range of mobility products such as wheelchairs and mobility scooters, has recently celebrated its 10-year anniversary, attributing its success to strong customer service and an ethos of helping people. Owner Meryl Side, who runs the business with her son Lawrence, invited Alex Turco to cut a celebration cake to mark the occasion. Alex opened the mobility store ten years ago, when he was the Chairman of Burnham’s Chamber of Trade, and told Burnham-On-Sea.com that he was ‘delighted’ to be invited back to hear about retailer’s success. Commenting on how the store has managed to be successful over the past ten years, Meryl told THIIS: “We try to give a personal service and be as friendly and helpful to all our customers as we can. We’ve got a good set of engineers and they always go the extra mile to help people out. “One of the things that we put on our labels is that ‘we’re here to help you’ and I think that makes the difference because we are here to help people. We try to help people as if they’re part of our family. 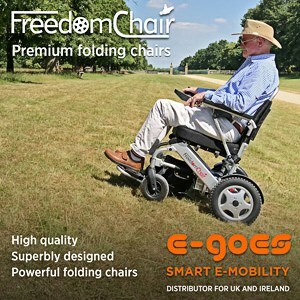 Established in October 2008, Burnham Mobility is a retailer offering a range of mobility products including mobility scooters, wheelchairs, powerchairs, walking aids, rise and recline chairs, and bathing aids.